Need a Job in Hohenfels? Hohenfels community members receive resume advice and help navigating USAjobs at the job fair. HOHENFELS, Germany – U.S Army Garrison Bavaria’s Family and Morale, Welfare and Recreation, Child and Youth Services, and Army Community Services hosted a job fair and resume building class for the Hohenfels community. The event was an opportunity for job-seeking community members to meet with directors and immediately apply for open positions. 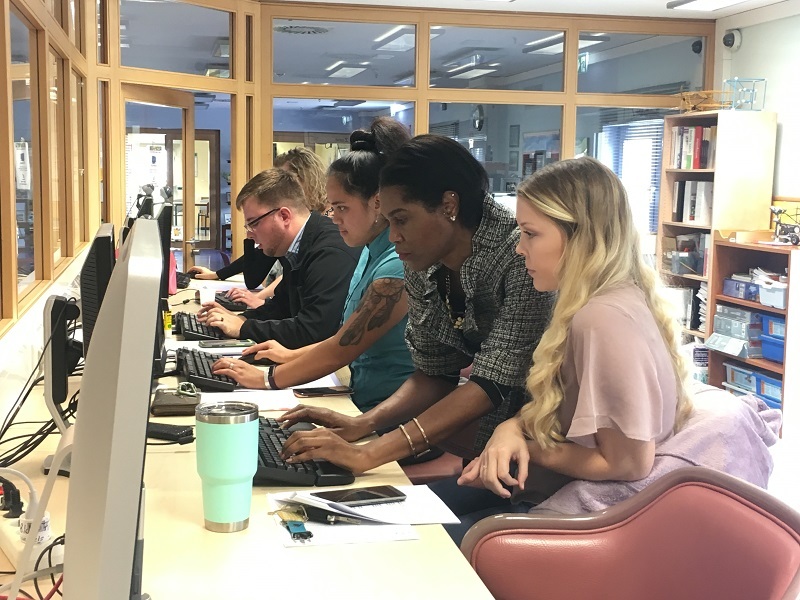 Non Appropriated Funds Civilian Personnel Advisory Center was on-site to answer questions, check the status of applications, and support attendees with navigating, and using, the USAJobs portal. The collaboration of the job fair and ACS’s resume class was key to the event’s success. The class was led by Connie McCreary, staff member, ACS, and assisted attendees with building their resumes and helped to correct mistakes made during the application process that would keep the application from being referred. Several participants submitted one or more applications for current job openings. Attendees learned of more than 20 positions open in the community after participating in the resume building class. They were then able to apply and interview for the positions on-site. Deltra Hearne, director, Hohenfels Child Development Center, participated in the job fair and is currently hiring for 12 positions. The Job Fair was a success as the directors were able to meet with qualified candidates. The candidates had the opportunity to ask CPAC questions about open positions and their applications. One job applicant expressed feeling relieved after speaking with NAF CPAC and learned that many of the applications she had submitted through USAJobs were being rejected because she did not have the correct paperwork uploaded in the system to reflect her spousal preference. She was excited to finally have an answer to the mystery of why she was not being referred for positions of which she was highly qualified. NAF CPAC helped clarify a common misconception about continuous open positions. When applicants see an open continuous position with an end date that is far out, that does not mean the position will not be available until the end date. Announcing positions as open continuous makes it a faster process when vacancies become available in any of the CYS programs. NAF CPAC can readily pull from the current list of applicants and the position stays posted as an ongoing announcement. So if you see a job announced with a date of say June 2018, do not be discouraged, just apply. FMWR, CYS, and ACS plan to host another Job Fair and Résumé Building event in February. For those interested, check the Hohenfels CYS Facebook Page or the Hohenfels Family and MWR Facebook Page for further details as well as keep an eye on USAJobs.gov for regular job postings.